This week's challenge over at Do It With Digi's is a sketch. I like these as it means there is a starting point, my only problem comes when I miss out vital elements!! 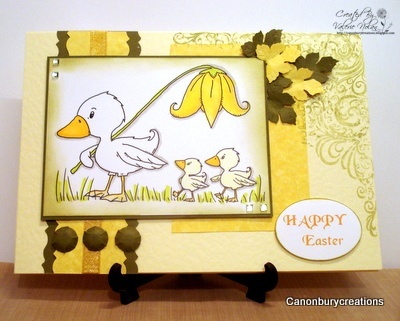 I wanted to make an Easter card with a digi stamp that came from Pollycraft for my son who loves ducks! I've used backing paper from my stash and coloured the digi with promarkers. I stamped the corner with a flourish stamp and Spanish Olive versamark chalk ink. I punched the leaves out and made the candy from the backing paper. The sentiment is computer generated. Aww this is so cute hun, love the image and the colours are so spring like. Love your punched leaves. Thanks for sharing it with the Digi Divas this time.